Aaargh me hearties, if you swabs want to find the treasure….. Well I can’t speak like that for the whole blog, can I? 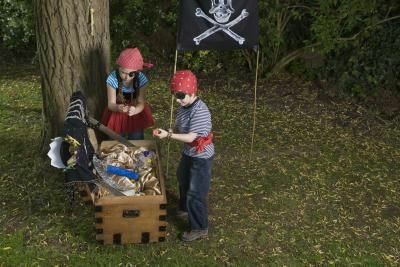 I have got some really awesome ideas for your treasure hunt, and I should say they don’t necessarily need to be for a pirate party. Simply adapt the treasure hunt to suit the theme and age of the party goers. The idea of a treasure hunt is to follow a series of clues in order to find some amazing treasure. It’s quite a simple idea but there are a few variations and a little preparation is required, so that may put you off organizing one. But it is definitely worth it as kids do have loads of fun playing and it can be a great finale to a party. For young children, particularly pre-schoolers or reception children picture clues for a treasure hunt can be fun. Take photos of places in the house or garden that you want the children to visit. Print them out before the party and hide the next clue in that area. Children keep following the picture clues until they reach the treasure. 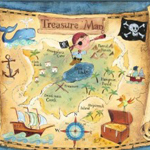 Print out or make your own treasure map directing children around the party venue, garden or if the children are older around the local woods or park. Children follow the map to each place you have marked on it and collect something at that location. 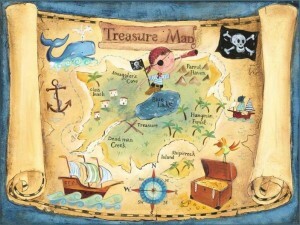 The items they collect will be a clue to the location of the treasure. Pieces of a jigsaw which you have to put together. When it is complete turn it over and the place the treasure is hidden is revealed. A piece of a photo of the place the treasure is hidden that can be put together when all the pieces are collected. A piece of a map that will lead them to the treasure. A gold coin that is needed to pay for the location of the treasure. Only once you find all the coins will the location be revealed. 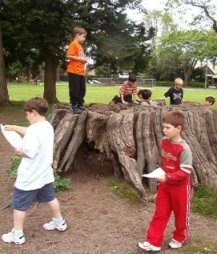 In a clue treasure hunt you need to write clues so the players can work out where the next clue is. This requires a little for-thought as you need to match the clue to the place. I‘m made of glass, this much is true. but when you look, you won’t see through. reflect on this, and you’ll find a clue! Or Go to the place where you see a reflection of your face. You can choose where you want the party goers to look and they come up with a number of different clues of varying difficulties, this is great as you can match the clue to the age of the children. A sandpit where the youngsters have to dig for gold coins which they can exchange for a prize. 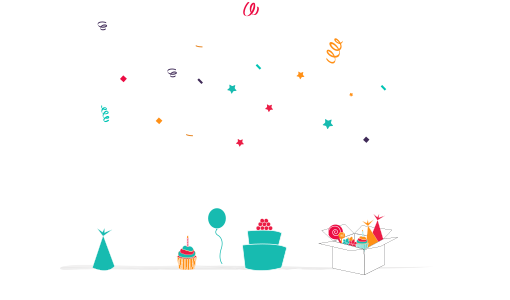 A Treasure Chest Shaped Pinata filled with goodies so the fun just keeps coming! Its great to see their faces with this unexpected party favourite. Whatever you decide to do on your treasure hunt have fun and we’d love to hear your treasure hunt party stories. 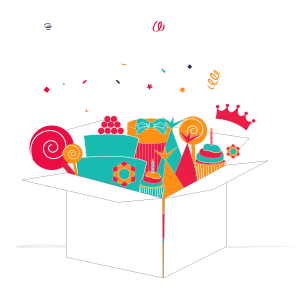 We’ve got even more Pirate Party games for you here and remember that BoxedUpParty can provide great themed parties for kids and pirate parties are one of our specialties.